Except for one colored rule file, this page is full of printable black and white and grayscale lined handwriting paper. Not only that, the papers come in various rule sizes and if you do not find what you need on this page, be sure to look on my other lined handwriting pages. If you need handwriting paper that has color lines, visit Color Rule Handwriting Paper and Yellow Line Paper. If instead you are looking for Printable lined paper that is known as "notebook filler paper", then you are in the wrong place. To see all of the filler paper that I have, go to Filler Paper and you will see a list of most of the filler paper that I have at donnayoung.org. This page does not hold all of my printable handwriting ruled paper at DonnaYoung.org. The 2012 Set has 9 rule sizes from 1 inch through 1/4 inch in 1/8 inch increments including 1 centimeter and 1/4 inch Tall. Rule sizes, when printed, may not be exactly as described. The rule lines are in shades of gray. The bottom line is the darkest and the middle line is the lightest. The set has all rule sizes in both fully ruled paper and blank top paper. Additionally, the 1/4 inch rule is available in a booklet format. The paper with the "1/4 inch Tall" rule is not symmetrical. The lowercase part of the rule is 1/8 inch, as it should be for a 1/4 rule, but the other two areas of the rule are taller. The uppercase part is 3/16 inch tall and the lowest part of the rule is 1/4 inch tall. This group of papers comes in 3 rule sizes that indicate they are to be used for grades preschool through 4th grade. This does not mean that these papers must be used for the grades specified; they are merely suggestions. Has 5 rows of lines. Has 6 rows of lines. Has 10 rows of lines. The files below are from various handwriting worksheet pages at donnayoung.org, but this isn't a complete list. 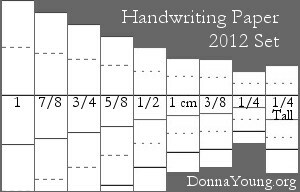 There are many choices of printable lined paper throughout the Handwriting section. The next group of handwriting paper prints vertically. The first set has the classic 3rd row and the last set does not. This is lesson paper, see more at Lesson Paper. "Practice This Sentence" - You can type one line per lesson group on the typeable pdf form. The font used for the sentence is not a handwriting font. The paper in the "ZB" set also includes blank-top paper. The paper in the "DN" set also includes blank-top paper. See more Double Line Paper at "Double Line Paper" set, also includes blank-top and 4-column paper. This style was requested by a school teacher many years ago. She wanted handwriting rule, but without the 3rd space. I was happy to be able to help. A Blank-Top version of this style was more recently requested. I made the files and linked them under the fully lined links in the table below; they are labeled "Blank Top." Hang up the phone! DN Style + rule height that is approximately 7/16" or about 12mm = WOW.